A 30-year-old patient, who was a doctor by profession, was presented in the OPD with an acute twisting injury to the knee after falling off a bike, On presentation, she was in tremendous pain with her knee stuck in 30 degrees of flexion, with inability to extend it further. The patient was stabilized first, and an MRI was performed which revealed a large bucket handle meniscus tear on the medial side. 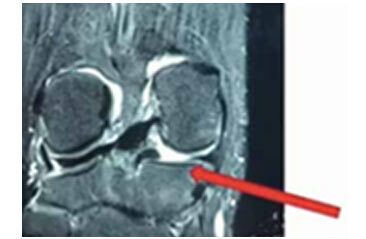 A final diagnosis of massive medial meniscus tear was made based on physical examination and MRI. The patient was counselled for undergoing an arthroscopic anterior cruciate ligment (ACL) reconstruction with a medial meniscus repair and was operated the next day. Arthroscopy reveealed a torn meniscus stuck like a door stopper between the femur and tibia on the medial side. 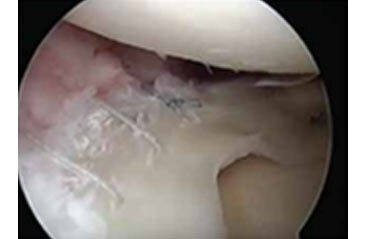 The meniscus was put back into place and stitched using advanced arthroscopic techniques. The patient was put on a rehabilitation protocol and made to walk the same day after surgery with the support of a walker. She resumed her normal routine after a week and remained symptom-free until she injured her another knee after two and a half months for which an arthroscopy was needed. Permission was taken to scope the side where the repair was done earlier to check the healing progress of the meniscus. The arthroscopy revealed an entirely healed up medial meniscus. The menisci are two 'C' shaped cushions between the thigh and leg bone which act as shock absorbers and prevent direct pressure on the cartilage over the femur and tibia condoles. Meniscus repair surgery is a knee preserving operation and should be preferred wherever possible by a specialist knee surgeon. 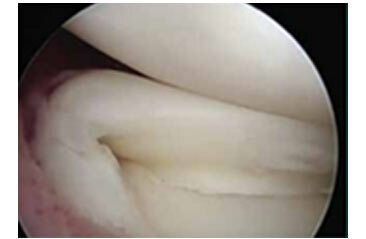 Conventionally the meniscus is partially removed by most surgeons. However, the meniscus has a vital role in providing cushioning to the cartilage and preventing degeneration of the knee. In this case, the knee of the patient was saved. She is back to sporting activities and doing what she does best, being a great doctor and surgeon. Max, Saket have numerous other satisfied patients like her that bear testmony to the success of this procedure in expert hands as a specialized knee and shoulder practice.